One of the most enjoyable side effects of qualification for major football tournaments is the music that emerges to mark the event. Ireland has a rich history in this department with eager balladeers stepping out of the undergrowth as soon as we topple our play-off opponents. The classic era for such recordings may have been in the build up to Italia ’90 but each successive appearance at a major tournament has yielded precious audio. Finding this music can be a difficult task however as the usually reliable Spotify is a big let-down with the heavy hitters such as ‘Give It A Lash Jack’ and ‘Put ‘Em Under Pressure’ nowhere to be seen (or heard for that matter). Youtube fairs much better but by the time you’ve located the big songs the game may have already started! So in the spirit of servicing your musical pre-match excitement you’ll find everything you need on this page. We’ve pulled recordings from every conceivable source so that by the time you reach the stadium you will have reached your very own personal green nirvan. 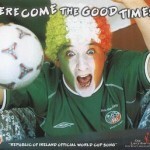 Please pass this page on to all your mates and especially that godawful DJ at the Aviva. We just can’t get enough of it. 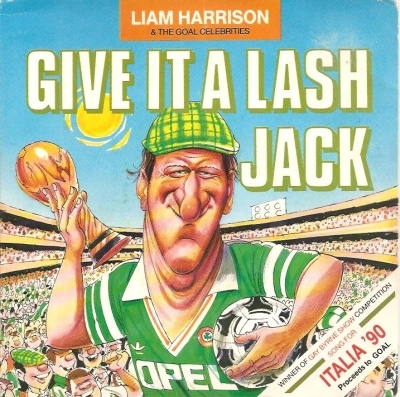 The big daddy of them all is certainly 1990’s ‘Put ‘em Under Pressure’ with the Irish squad for Italia ’90 giving it gusto on the olé front at the chorus while Jack Charlton sloganeered throughout. With Larry Mullen lending a hand on production and drumming duties, a central guitar lick courtesy of Sean O Riada’s ‘O’ Neill’s March’ (and most effectively used by Dublin band Horslips’ on ‘Dearg Doom’) and Moya Brennan of Clannad providing the ghostly vocal at the beginning this was an all-round classic football song. People of a certain vintage can remember ‘Put ‘em Under Pressure’ replacing the national anthem at discos around the land in the build up to that glorious summer in Italy. 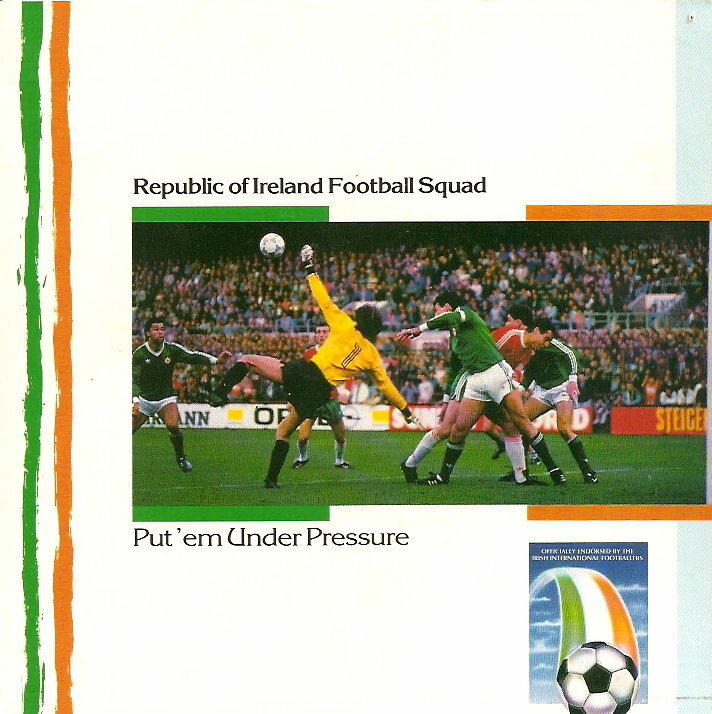 It still sounds great decades after its initial release which makes its absence from pre-match build-ups in the Aviva all the more confounding. 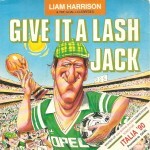 It might forever be in the shadow of ‘Put ‘em Under Pressure’ but as original Irish football songs go nothing can quite top Liam Harrison’s ‘Give It A Lash Jack’. Opening with much loved South Terrace favourite ‘Here We Go, Here We Go, Here We Go’ this was a composition with lyrical dexterity and impressive singalong qualities. 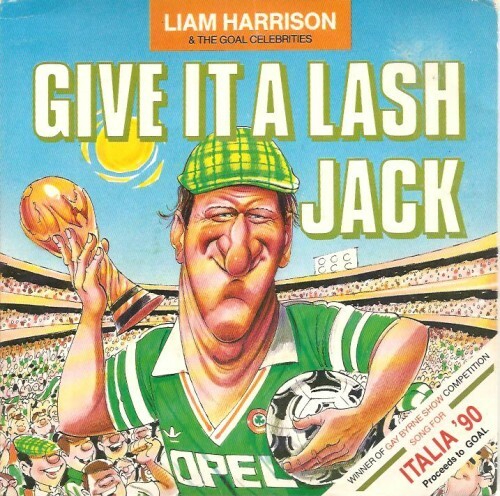 The fact that all proceeds for ‘Give It A Lash Jack’ went to the Goal charity just added the cherry to this venerable piece of football escapism. It hardly matters that ‘Joxer’ was never recorded in a studio because Christy Moore provided an incendiary live version. Not many can match Christy for searing intensity, with just a guitar and a wet brow he was at his mischievous best chronicling the hapless Irish supporter Joxer as he followed the Boys in Green around Germany on their Euro ’88 adventures. Over its many verses Joxer would see Ireland beat the old enemy England and fall in love with a German girl by the banks of the Rhine. Not bad for his first trip abroad! Read all the lyrical chestnuts . Billy Joel’s original ‘We’re Gonna Start A Fire’ was a tad annoying but when a former showband from Glasnevin called the Memories decided to sprinkle it with lyrics about the Boys in Green we were instantly smitten. 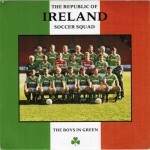 Like the songs mentioned above ‘The Game’ was released in the golden period for Irish Football songs back in 1990 and was typical of the country’s rabid adoration towards the Irish team. On its original release it instantly went to number one in the music charts. 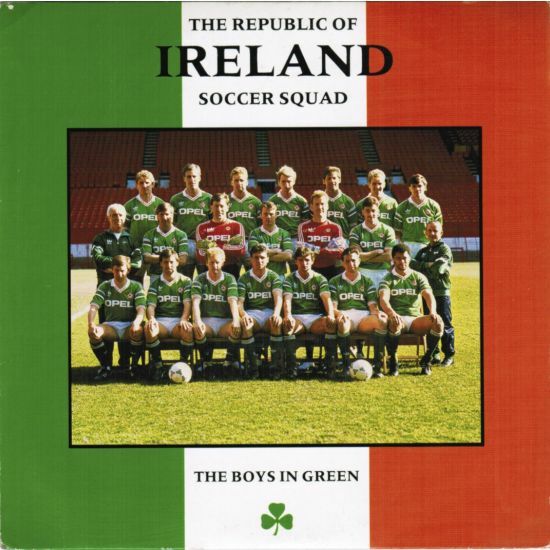 It may be the original Irish Football song but ‘The Boys in Green’ is certainly not the best song about the Irish football team. In fact it is so leaden I had to check whether I had the vinyl single on at the right speed back in the day. But for all that it certainly has a cherubic quality and you’ve got to admire the class of ’88 for giving it their all despite a resolute lack of musical talent. The clip below is a Late Late show performance the team gave before they set out for the tournament in Germany which means it also includes a spirited Gay Byrne amongst the tone deaf chorus of footballers. We certainly showed them what we got (whether they liked it or not). Cruelly ignored at the time of its release in the run up to the disastrous Euro 2012 tournament in Poland here was a rare example of a critically lauded band recording an original football song. 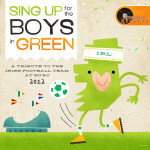 ‘Sea of Green’ was taken from album dedicated to the Irish team named ‘Sing Up For The Boys in Green‘ was just made for those RTE ensemble pieces that gathered all the best moments from Ireland’s escapades. With a distinct lack of such moments, on the field at least, ‘Sea of Green’ has sadly faded from view. Trim’s finest however have provided us with an anthemic number that should re-emerge as the Irish team starts to make headway again. Another classic from 1990’s adventures and sadly a song that seems to have slipped out of consciousness completely amongst the Irish fans. ‘Jack’s Heroes’ is an ode to Jack Charlton’s team and is infused with plenty of spectacle from the two wildly hirsute traditional bands. 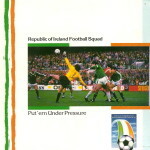 It was included on the Pogues single ‘Yeah Yeah Yeah Yeah Yeah’ single which went to number 4 in the Irish charts. ‘Jack’s Heroes’ is just perfect for whipping you into a pre-match frenzy. 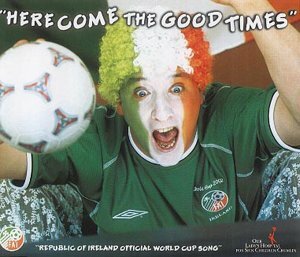 ‘Here Comes The Good Times’ was a 1996 song from the genius pen of Dave Couse and his band A House which was updated by Nicky Byrne of Westlife, Christy Dignam of Aslan and the 2002 Irish Squad before their trip to the Far East and World Cup 2002. While A House fans may have winced the good vibes and euphoric nature of the original remained intact, helped in no small measure by the presence of Couse himself on production duties. With lyrics pulled from the pick of suggestions from listeners of the Ray Darcy radio show this was a team effort; much like what the players had to muster following the chaotic tragedy of Saipan. ‘Here Come The Good Times’ went to Number 1 in the Irish charts. 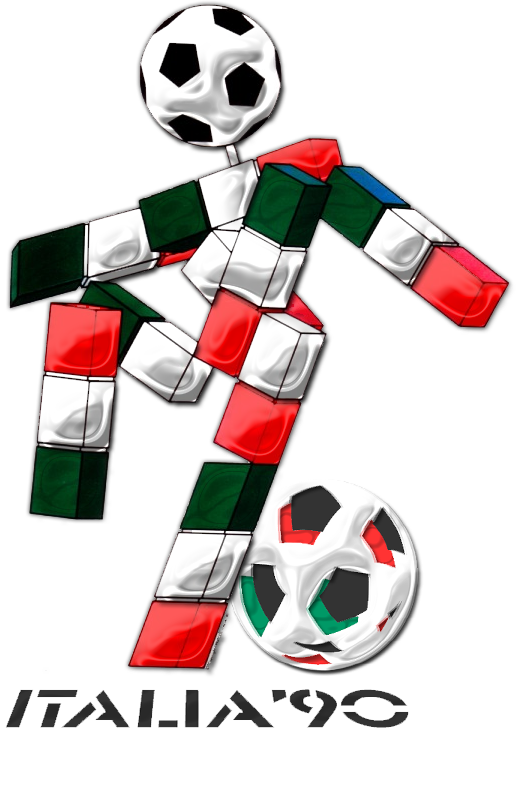 This song was recorded and around Italia ‘90 and it was godawful, so cringe inducing in fact that even the internet has decided to remove all talk of it. What is worrying however is that the tune is still doing keepy-uppy’s in my head and despite many attempts it clearly will not be shifted. For all its impressive production qualities this one just stank of opportunism and lack of creativity. 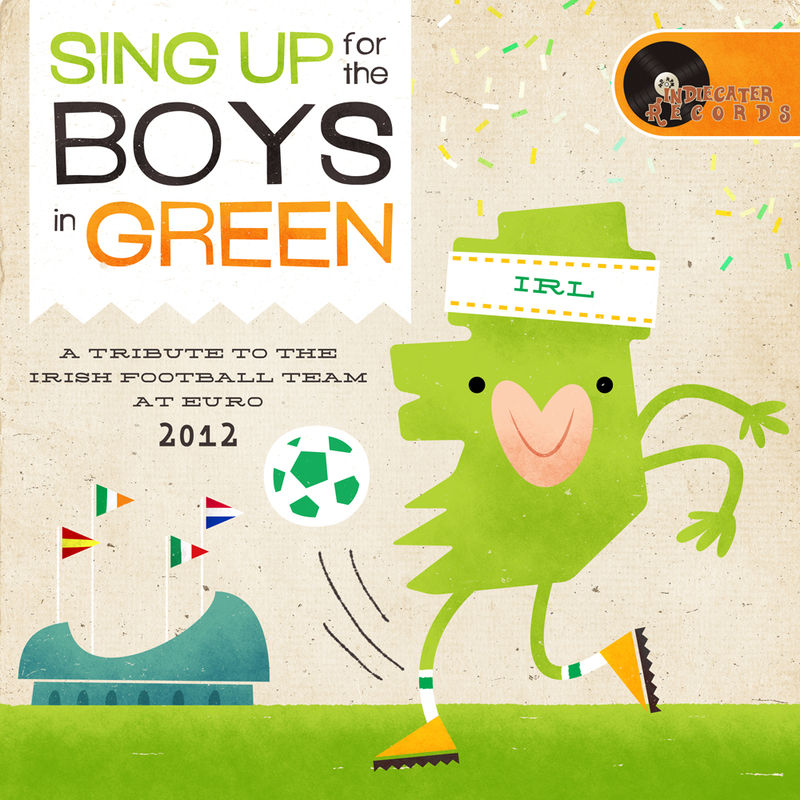 Kind of like the aforementioned ‘Boys in Green’ without the green tinged innocence and the let’s give it a lash of yore. No, ‘The Rocky Road To Poland’ was a sort of Eddie McGoldrick on record with charlatans such as Bressie (I used to play Rugby) and Danny O’Reilly (I try to play music) adding to a chorus of chancers, among them the loveable rogues the Dubliners who recorded the admittedly lively ‘Rocky Road To Dublin’ back in 1964. As ever there were mitigating circumstances with proceeds from the sale of the song going to John Giles Foundation and the Irish Cancer Society. And again when the good times are a flowing we’ll accept any musical sewer once it has a green pulse. This is another one from our last tournament in Poland and it scores 10/10 for enthusiasm and quite a few marks for being a decent tune too. The video is homemade and all the better for it with the Mulligan Brothers and their local gang giving it football socks. We had to include this because firstly it is funny and secondly because it includes a drum beat that is deserving of the samba boys from Brazil. For all that the less said about the lad dressed in the tiger suit the better. 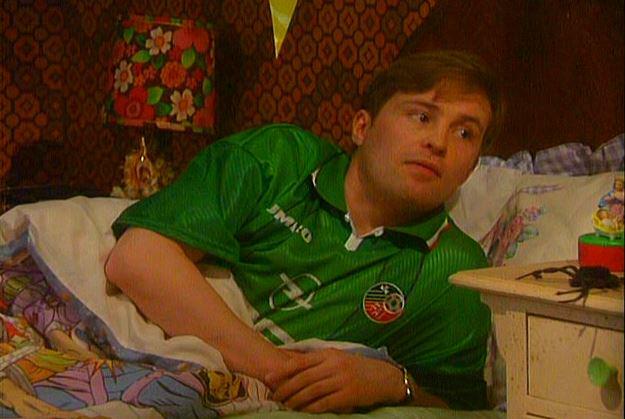 Dougal would have been so proud! Joxer packed his German phrase-book, and jump-leads for the van. Ah well some of the lads had never been away from home before. It was the first time Whacker put his foot outside of Inchicore. So we all agreed that Joxer was the man to drive the van. With the engine overheating from long-hauling duty free. Was arm-in-arm with Jack Charlton, singing ‘Revenge for Skibbereen’. Ah jeez, well didn’t she show up in Ballyfermot last week …. Dubliners wrote rocky road to Dublin. …really? That’s amended now Martin, thanks for pointing it out!